Benjamin Curtis, guitarist, producer and leader of the atmospheric pop band School Of Seven Bells, died Sunday night (December 29th) in New York following a yearlong battle with T-cell Lymphoblastic Lymphoma, a rare type of non-Hodgkin lymphoma. He was 35 years old. Curtis, an Oklahoma native, moved to Dallas with his brother Brandon. The two joined the band UFOFU, but shortly after, Benjamin became the drummer for the alt-rock outfit Tripping Daisy. Following that band's breakup, Curtis and his brother formed the "space rock" group Secret Machines. 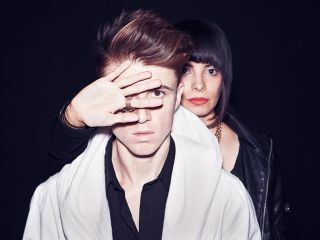 In 2007, Curtis, along with twin-sister vocalists Alejandra and Claudia Deheza, started School Of Seven Bells in New York City. The trio released two well-received albums, 2008's Alpinisms and 2010's Disconnect From Desire, before Claudia left due to personal reasons. With Alejandra as the band's sole vocalist, School Of Seven Bells continued on, releasing last year's Ghostory. In February, Curtis revealed his cancer diagnosis. Artists such as Devendra Banhart, Paul Banks, Albert Hammond Jr., and many others participated in benefit concerts to cover medical treatments. A message on the School Of Seven Bells' Facebook page reads: "We can't thank all of you who supported him and his music through the years enough. All of you who attended or participated in the various benefits in and around New York City over the past year since his diagnosis, and of course those who contributed and gave generously to help support him throughout that journey. "You made it possible for all of us, and for him, to see how truly loved he was and how many lives he had touched through his music by your gestures. We will all miss this incredibly talented and rare person every day, but we are fortunate enough that he shared with us his music, and that is something that we can keep forever."